Doors open at 6pm. Food available from Twisted Barrel Wood-fired Pizza and Back Alley Kitchen through 7:30pm; beer, wine, water, and soda sold by CCA pre-show and during intermission. Originally formed to perform multi-instrumentalist Jeff Engholm's solo album, Summit Climb in the year 2000, Collective Unconscious has grown from those humble roots to become one of Minnesota's premiere groups. Through the years, the band has performed not only their own music, but expanded into a new genre: album shows. Starting in 2005 with performing The Beatles "Abbey Road" from first track to last (Come Together to Her Majesty), with special guest and semi-band member, Stacy Bauer, they jumped into one of their most ambitious projects, The Beach Boys' 1966 classic, "Pet Sounds". On stage will be an army of musicians: a 24-member orchestra including a string quartet, vocal quartet, horn section, vibes, timpani, bass harmonica and a Theremin to name a few! With this ensemble, the Collective Unconscious will recapture the beautiful and spiritual music that is Pet Sounds. 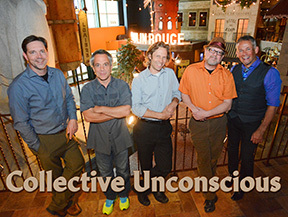 Joining Collective Unconscious on stage will be jazz pianist George Maurer, vocal quartet The Half Steps and Jeff & Tommy Vee (sons of music legend Bobby Vee). Pet Sounds was originally released in 1966 and included the hits "Wouldn't It Be Nice," "Sloop John B." and "God Only Knows." Featuring the more mature and creative compositions of Brian Wilson, the album went on to influence a whole range of other artists and bands, not the least of which was The Beatles who recorded Sergeant Pepper's Lonely Hearts Club Band in response. It has consistently remained at the top of critic’s lists of the best albums of all time. Rolling Stone Magazine ranked it #2 behind Sgt. Pepper’s, MOJO Magazine (UK) ranked it #1. Main floor and lower balcony are reserved seating. Upper balcony is general admission which do not go on sale until all reserved seats are sold. General admission seats are selected by ticket holders the night of the show. A 75 cent per ticket fee also applies to support upgrades to Chatfield Center for the Arts' online ticketing portal.